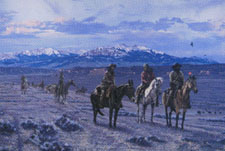 "NEW TRACKS ON OLD TRAILS"
Following the ancient Indians trails that crossed the Bighorn Basin of Wyoming was a combined brigade of wilderness hardened trappers. Under the joint command of Jim Bridger, Tom Fitzpatrick, and Milton Sublette, they had trapped the Wind River, Owl Creek, and Absorkee Mountains. Reaching the Stinking Water, now the Shoshone River, late in the summer of 1833, they headed for Fort Cass, a small trading post at the junction of the Bighorn and Yellowstone Rivers. Stories of the men who first explored the country west of the Mississippi River now fill the pages of many books and ignite the imagination of those that read them. Their names and exploits will never fade. Exclusive issue of only 500 signed and numbered artist's prints at $175.00 each. Image size 30" X 20".